Contrary to popular belief, Hamburger did not originate from Hamburg, Germany. Instead, it's Hamburg, New York, USA. Anyway, spotted this sign at a Kopitiam around Clementi Avenue 2 and I thought to myself. If the Americans have the Hamburger and even our Malay brothers have their Ramly Burger, how can we lose out so easily? We also must have our own burger! 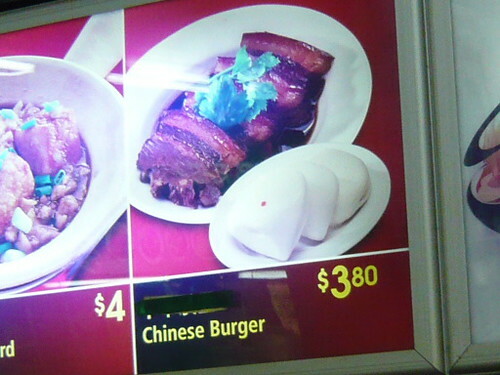 Ladies and Gentlemen, I present to you our Chinese burger. The KONG BAK PAO!!! It's has be decades since I have had good KBP. My last recollection was the MacPherson Market when I was a kid. It was a ritual to be eating there on a regular basis. There was no air-con, just fans high up in the ceiling under the sweltering noon sun. It was a time before food courts and the tables were all the foldable types and stools, metal and stackable. Another icon there etched deep in my memory was the pen salesman that peddles Parkers, Cross, Duponts from table to table at the market. Back then the Zebra Sharbo pens was all the rage. It touted to be the first ever pen to have the option of a ball-point pen and a mechanical pencil in the same pen. I remember my dad suckered into buying one as he succumbed to the temptation of the TV commercials that were airing them at $16 and $25 relentlessly. Oh yes, I remember this. They are too die for! But one portion of this = one week in the gym. If you are watching your diet, strike this off. Razlan: No problem for me. I'd glad do an extra week of gym anyway.